Sister Dottie Almoney, director of education and outreach at St. Peter’s Lutheran Church in Lancaster, is featured in a Deaconess Community advocacy video “Who Is Not our Neighbor” about the 2018 Farm Bill. 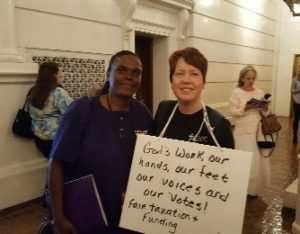 Almoney, who was the Lower Susquehanna Synod recipient of the “Serve.Pray.Speak.” award at this year’s Lutheran Day in the Capitol, shares her passion and persistence in this ministry of speaking up with and for those who are hungry. Where will you get your next meal? For 41 million Americans this is a question they need to face daily. Almoney discusses the implications of that for people of faith in a recent conversation with John Johnson, program director for domestic policy, ELCA Advocacy, and Deacon Nick Bates Director of Hunger Network in Ohio. Watch the whole video here. Johnson said that for years, the federal government has supplied food aid to those who are in need through bipartisan legislation. Once called Food Stamps, now called SNAP benefits, these benefits are authorized through the Farm Bill. Under the current administration, the House leadership has purposed reducing the benefits and increasing the work requirements to receive this food aid. The House’s proposed cuts would drastically reduce food aid to every person who receives it. This is because, state, local and non-profit hunger-relief programs rely on SNAP. What can you do? There most effective way to help is by contacting your legislators. Click here to send a letter to Congress. “The one thing that elected officials are afraid of is losing an election,” John Johnson said. The only way to pressure the House to abandon their cuts is to let them know that voters oppose them.